Q: My doctor advised me to give up my soda habit, but I was thinking about switching to diet soda. What is your advice about the safety of artificial sweeteners? A: I support your decision to decrease the amount of added sugar in your diet, but it is less clear if artificial sweeteners are the answer. These sugar substitutes do appear to be safe when consumed in usual amounts. Initial studies in rats, performed decades ago, raised a possible link to bladder cancer, but no subsequent studies in humans have confirmed this relationship. Despite the safety record, there is still a question about the efficacy of sweeteners to reduce weight and prevent complications of obesity. Artificial sweeteners, also known as non-nutritive sweeteners, are compounds that sweeten foods without adding calories. 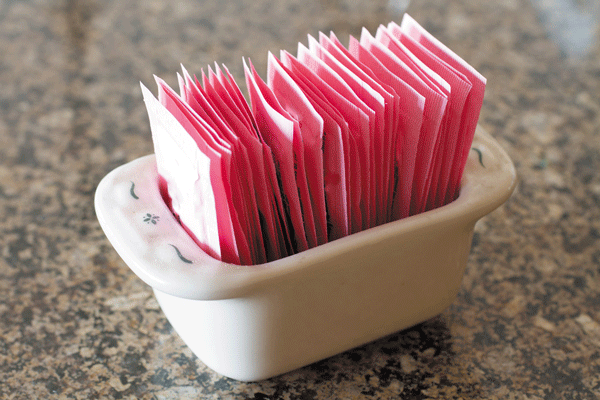 The most common types are aspartame (Equal, NutraSweet), sucralose (Splenda), and saccharin (Sweet'N Low). All three are sweeter than an equivalent amount of sugar, which has 15 calories per teaspoon. A 12-ounce can of soda contains 150 to 180 calories from sugar. Although non-nutritive sweeteners have zero calories, they may not be effective for reducing your overall calorie intake, and thus may do little to help you lose weight and lower your risk of obesity and diabetes. It is possible that some people drink sugar-free beverages to rationalize eating unhealthy foods (e.g., ordering a diet soda at a fast-food restaurant). Another theory is that the excessive sweetness of these compounds leads to cravings for more sweets. So, you can certainly consume moderate amounts of diet beverages safely, but it may not be the healthiest choice.